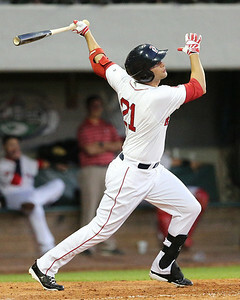 The Red Sox will recall outfielder/first baseman Alex Hassan prior to Friday night's game and place Ryan Lavarnway on the 15-day disabled list, reports Danny Ventura of the Boston Herald and confirmed by multiple sources. This will mark Hassan's first stint at the major league level, and represents a homecoming - Hassan grew up in Milton, Mass. and played at Boston College High School. Boston manager John Farrell also announced following Thursday's game that right-handed pitcher Rubby De La Rosa would be the starting pitcher on Saturday at Fenway Park. Hassan, 26, was drafted by the Red Sox out of Duke in the 20th round of the 2009 draft. As he worked his way up the ladder, he became known for his patient approach and ability to get on base. Across parts of six minor league seasons, Hassan has a .393 on-base percentage, buoyed by a 13.9% walk rate. Added to the 40-man roster before the 2013 season, Hassan missed the start of that season with a fracture in his left foot. He returned from that injury in June and went on to have the strongest statistical season of his professional career, hitting .321/.431/.460 in 255 plate appearances. Drafted as an outfielder, Hassan also began to see some playing time at first base in 2013. That versatility will be handy, as the Red Sox are short on first basemen with Mike Napoli on the disabled list with a fractured finger and Lavarnway joining him with a wrist injury. De La Rosa will be making his first major league start since July 31, 2011 when he was a member of the Los Angeles Dodgers. Since then, he underwent Tommy John surgery and was traded to Boston as part of the deal that sent Adrian Gonzalez, Carl Crawford and Josh Beckett to Los Angeles. De La Rosa made 11 appaearances out of the Boston bullpen in 2013, posting a 5.56 and striking out six while walking only two in 11 1/3 innings. The 25-year-old right-hander is off to a strong start in 2014. He was named the SoxProspects.com Pitcher of the Month in April, and overall has a 3.04 ERA in ten starts. De La Rosa will take the spot in the rotation of Clay Buchholz, who was placed on the disabled list with a hyperextended knee on Wednesday. His official recall will not be made until Saturday, as the team will need to make another move to clear a spot on the 25-man roster.